JYJ, who is currently in the midst of their world tour has confirmed their American region performance schedule. Starting with the concert in Vancouver, Canada on 20 May, then America’s New Jersey on 22 May, Los Angeles on 27 May, and San Jose on 3 June, the “JYJ WORLD TOUR in 2011” will be held. 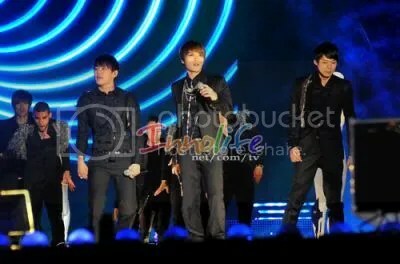 Before this, JYJ had kicked off their World Tour on 2 & 3 April at the Impact Arena in Bangkok, Thailand. They showed their amazing popularity by drawing a crowd of 22,000 people between the 2 days. The concert continues on 23 April in Taiwan and 7 May in Beijing, China. After completing performances in Vancouver and the 4 cities in North America, the World Tour will end its long conquest on 11 & 12 June in Busan. Member Kim Jaejoong has taken on the role of Stage Director for this JYJ World Tour. Jaejoong, who is very interested in the stage production, has been involved in the stage, video effects, and all other aspects of the JYJ concerts, including that of the first concert that was held in Korea.